ClickEshop blog brings you information about latest added features and interesting articles. You take care of your business and we provide you with professional support for your online presentation. Do your products have new variants or parameters? The existing and newly added parameters can be customized and set them own custom order. In the particular parameter settings just enter the number at which you wish the parameter to appear. The newly-added functionality allows you to change the number of already created columns (increase / decrease) and the system automatically re-calculates the width of all columns. After inserting the column, the system adds a new column to the right and copies the content and formatting of the original column to make the work even easier. You can easily edit slider images with slider editor. Just click the slider image and choose "Edit" on the toolbar. Directly in the slider editor you can: change images, add new images, delete images from the slider, set the hyperlinks, and slider timing. 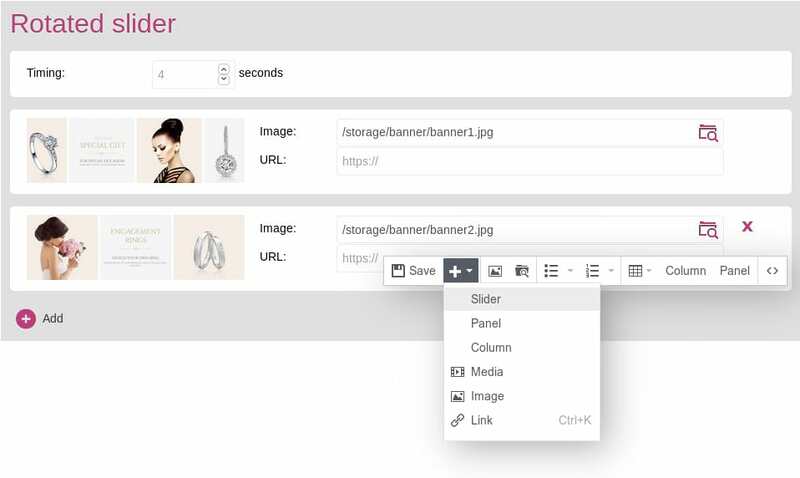 Slider can be added anywhere on the page by clicking the "plus" icon - Slider on the toolbar. We are pleased to receive positive feedback on the new billing system. This module has been extended by a new type of document - Claims. As well as other documents a claim can be created quickly in a few clicks from another document e.g. orders or invoices. We are still looking for ways to simplify your work with the system. Therefore, two new icons now appear in the product overview when you mouse over a product: one for quick editing of product settings and the other for quick availability settings. Do you offer free shipping option for orders over a certain amount? Promote your online shop and increase your sales thanks to this competitive advantage. After a product has been placed into the cart, the customer is shown the residual value to get a free delivery. You can turn on displaying free shipping information clicking Global Settings - Project Setup - Display information regarding free delivery. Wholesale and B2B customers are mostly interested in excl. VAT prices. In project setup you have the option to choose how to display the product prices and set excl. VAT price or incl. VAT price to be primary. You can turn on this setting anytime you want and your online store is so ready to grow up with you. Are you selling abroad and your customers are VAT registered companies? The system allows you to issue an order automatically without VAT, if the customer in the billing information ticks the box "I am a VAT payer". To enable selling without VAT, the project settings have been extended with a new field "Calculate zero VAT for foreign companies (VAT payers)". Do you offer additional services to products you are selling? Or do you have some used products in your offer? Such items aren't normally accepted by online catalogs. ClickEshop will help you also in such cases. Products can be included in the online store offer and at the same time excluded from export for online catalogs. To exclude a product from the catalogs, simply check in product detail "Exclude from Catalogs (XML feeds)". Working with the system is even easier and new products can be assigned to multiple categories at once by clicking all the categories that the product should belongs to. The export for all types of documents has been extended with .xls (Excel) option. These reports can be subsequently used for further statistical processing for various purposes. Get a quick business insight about the last online store performance and also compared with the previous year. just after signing into ClickEshop administration. Reports and statistics are perfect tools for taking right decisions but also can help to identify weak spots that you have not noticed or simply forgotten. You control your business and easily adjust your eshop to a higher level. Once an order has been created, the customer will receive an email with order details in the attachment. To have an important information, such as: the chosen mode of transport or payment and the total amount of the order at hand, this information was added directly to the body of the email. Are you selling products to Czech republik and sending by Czech post? Simplify your work. Order information can be exported directly from the administration and subsequently inserted into the Czech Post system without rewriting. How does it work? Tick the required orders in CUSTOMERS / Orders / Export couriers / Czech Post (ePA) and choose whether the goods will be shipped with cash on delivery or not. Do you have various documents that need to distinguished? Each document has the option to create additional PDF document template that can be overwritten or translated into another language. In this way, you can create multiple templates eg. price offers or invoices in different languages or for sending goods abroad, create an invoice template for VAT payers and non-VAT payer customers. For printing purposes the system uses a template that is marked with a "ball". To download the PDF document just click the PDF icon and the desired template. PDF documents can be downloaded in bulk in the documents overview. Documents in various currencies - If you need to issue a document in another currency, just select the currency from the list of currencies used for the online store. To change the currency, use the icon that located in each document detail under the inserted document items. Edit product infotext - additional information displayed in product detail "infotext" bellow the product price can also be customized through export-import products. Are you doing business abroad or would like to reach new customers? The newly added payment gateway supports 17 language locations used in 149 countries worldwide and accepts card payments in 6 currencies: CZK, EUR, PLN, HUF, USD and GBP. You can activate the payment gateway in the ClickEshop administration clicking GLOBAL SETTINGS / Payments / ComGate. Your customers can pick up their ordered products on the next day at the Pickup point they choose from a pre-filled list . Before work, during the lunch, after work, so at any time during the opening hours of the Pickup point. You can activate Zasielkovna clicking GLOBAL SETTINGS / Delivery / Zasielkovna. Furthermore, you don't need to rewrite the information about orders. Just click CUSTOMERS / Orders / Export Couriers / Zasielkovna. Keep it simple, be lazy and let the system work for you. Just select the orders and click - Export Couriers / DHL. The system creates a pre-filled spreadsheet to DHL courier. Would you like to inform customers about something important? Take the advantage of the newly added field in the product detail. You can insert an image or other formatted text with information such as: free delivery, gift to order etc. Can't you imagine what we're talking about? Click on the following link to see the blue text about Free Delivery for orders over €100. You can easily import invoices into your accounting system or for the company that keeps your accounting. Click CUSTOMERS / Invoices / Export Accounting sys. Rebate for a given B2B group can be individually changed in the product detail. A new product type suitable for eg. gift to an order or a product catalogue. Such product has hidden prices and there is no possibility for buying such product or button for more information. This product can't be normally inserted into the shopping cart unless the customer meets the conditions for obtaining it. Based on the GDPR regulation and personal data processing in European Union on 21 May 2018 comes into force new General business terms and conditions for using ClickEshop services. We'd like to ensure you that your personal data and projects are secured with state-of-the-art technologies. The use of ClickEshop services is not affected by this and you can continue using them as you are used to. Take the opportunity to create different types of documents directly from your administration: invoices, proforma-invoices, credit notes, business offers and delivery notes. One document can be linked to many other related ones. Documents are always available, not related to a specific computer. Save your time while handling the shipments and take the advantage of exporting orders to transport companies. Just select the orders and click - Export Couriers. The system creates a pre-filled spreadsheet to the selected courier. On 25 May 2018 comes into force GDPR regulation on personal data protection in European Union. It will effects everyone who receives, collects and processes personal data of individuals in the EU. Do your customers regularly buy the similar items? Let them duplicate an order and its contents using the copy feature after signing in to your customer eshop. We have updated the video manual that will take you through the basic steps of creating a website. New video manual for online store shows you how to change the logo, add a product, set parameters, create a gallery and much more. If you enter the number of product variants in stock, you activate the automatic warehouse system. The number of product variants in stock will be automatically reduced according to customers' orders. If the product variant is sold out, customer will be displayed the information from the field [Availability] eg. in 10 days, sold out etc. If you check the box "Do not allow to order after sold out", the product variant will be deactivated after the last piece has been sold. Join the growing trend of B2B wholesale relationships and boost your competitiveness through the ClickEshop B2B module. A well-designed and functional B2B system is an essential tool for wholesalers and an important communication tool between you and your business partner. If you have contract partners to sell products or standard online store isn't good enough for you, let your wholesale customers shop for better prices you set them. 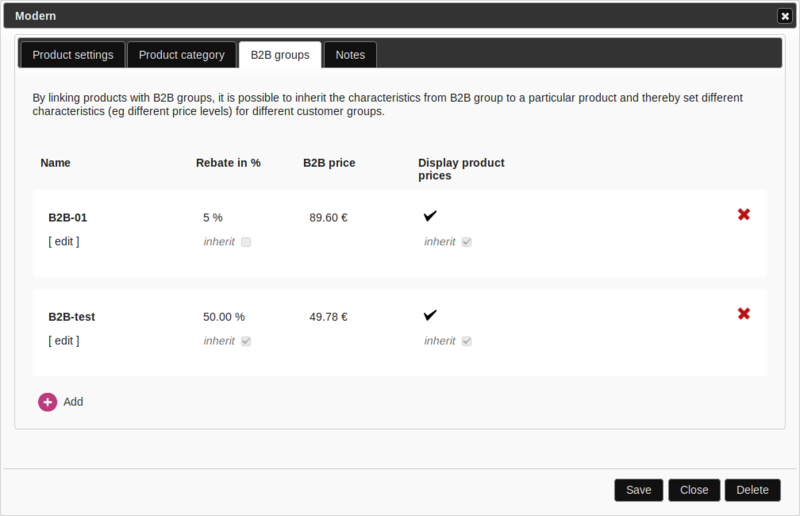 Customers' rebates can be set up in detail on product level different for each B2B group. To create new B2B goup click CUSTOMERS - B2B Groups. Comprehensive overview of your customers, their rebates and contracts in one place. Enjoy the benefits that it offers. The necessary information about customers is always available, whether at work or on a business trip. Do you want to ensure the minimum profit per order or just focus on wholesalers? Discover the new B2B module extension that lets you set the minimum order amount. Customers can click on Proceed to Purchase button when their order subtotals reaches the minimum amount otherwise the information about the minimum order value is displayed. In an effort to make good services even better, we have introduced another more consistent anti-spam protections for Email hosting services. Allow your wholesale customers to buy items at a lower price you set, but keep a good overview of the individual retail prices of each customer. New B2B feature enables you to sign in to your customer's online store as a customer, see the actual prices and create an order on behalf of your customer. Connect with your current patients and speak to potential ones with our new MEDICAL template. Publish the important information online and keep your website up-to-date without any programmer skills. It's mobile friendly and easy to use. Each country has its own specifics in the way the prices are displayed, and you have your own ideas as well. So how can we please you all? Thanks to the new module, it's possible to set it up directly in the ClickEshop administration: price display format, round the total price of the order or set the predefined VAT rate. Nowadays everybody has a car and everybody has to decide where to go for car maintenance and repairs. Let you customer to find you more easily. Create your own website with ClickEshop and use our new web template specially designed for CAR REPAIR SERVICES. If your product variant is out of stock, but it will be back in stock soon, do not delete such parameter just keep it deactivated. Do you work in CONSTRUCTION? Are you thinking of a new website or just want a modern one? Get your business the attention it deserves with our new building company template. Just insert your own logo, texts, images and that's all. It's so easy. Would you like to divide your site into attractive parts and keep its responsibility? Discover the advantages of using columns and panels. Panel lets you to create site designed to your desired width and columns will divide the site into as many parts you want. But that's not enough! Drag the mouse and change the column width or put columns into column. Isn't it interesting? Click the right mouse button and select Panel or Column. Present yourself stylishly with parallax web page where the text in the image is moving slower than the image itself. At the same time, you can use the predefined settings to create menu item hyperlinks directly to specific places on the page instead of displaying subpage. Do your customers forget to choose product variant? It won't happen again. If the product has parameters, the system automatically alerts the customer to choose the variant and only then allows to proceed with the purchase. Create your web presentation with ClickEshop and promote your BEAUTY SALON effectively. Duplicate easily your ClickEshop menu items with one click. Create a copy of an existing menu item with all its content and structure as well. Real time saver eg. while creating blog. New restaurant website template designed to match your RESTAURANT’S appeal. Do you want a new website or plan to redesign your existing one? Don't waste your time and create the ideal online presence for your restaurant or coffee shop. Web developers can customize the web page / online shop with own .JS, .CSS files and HTML codes. Global HTML code gives you now extended possibilities to insert own files to page header and page footer. Do your customers have favourite product producers? Let them easily find their desired products. Just create the category filters automatically according to product producer. Something that you will like - selected variant in picture gallery is marked also with tick icon. As an administrator you can write own notes to selected orders (e.g., product added, changed delivery, additional discount, etc.). Orders with written notes are highlighted with a new note. Quick note preview allows you to see notes written by customer and notes written by administrator without the need to open the orders. Secure your site with SSL certificate and improve your SEO rankings. Google prefers and rewards secured (SSL) sites that are using encrypted HTTPS connections to promote online security. So, don't lag behind. Update your product information with an extended XML file. When importing products, simply check the parameters of the product you wish to update. If you are using automatic warehouse system you can decide whether the customers will be able to order sold out products (eg. in 7 days) or the system will automatically change the product status and the customers will not have the possibility to order such products. Extended product settings allows you to show product prices without possibility to buy the product. Perfect for creating product catalogue, gift to an order (free gift or for a discounted price). Sometimes you need to create an order for your customer manually. For such cases we've added the possibility to add new order / invoice directly from your ClickEshop admin. Once you’ve placed the order, you can view it just like a normal online order. Make it simpler. ClickEshop provides you connection to transport company DPD courier and Slovak Post. ClickEshop system automatically exports data in required format and makes your work more comfortable. Do you need to know which orders send by post and which by courier? Received orders have been extended by filtering according to the chosen method of transport and also the payment method. Are you an international company? PayU is a leading payment services provider with presence in 16 growth markets across the world. The list of received orders has been extended by icons for quick preview. The "Eye" icon opens the order in a new tab and allow you to work with multiple orders at the same time. More precise product classification displayed in the online catalogue Heureka you can ensure by specifying each category in Heureka category tree. Actual information for your customers. The availablity XML file updates the warehouse stock on heureka.sk every 10 minutes. To activate the availablility XML file, just set the number of items in stock or days for shipping. The availablity XML file handles heureka only in paid PPC mode. An optional parameter "EAN" has been added to product detail. The information about EAN is not displayed to customer unless data is entered in the field EAN. Take a look at ClickEshop new templates optimized for mobile devices, tablets and computers. In the near future you can enjoy another nice templates for your business. The connection to the Pohoda accounting system has been expanded by the possibility to import data from the Pohoda accounting system into ClickEshop (updating the product and category warehouse). We are pleased that you wish to have all the services "under one roof". All services can now be managed in one administration after logging in to ClickEshop. ClickEshop Email hosting brings you efficient e-mail management options under your own domain (not under the domain of free mail hosting companies such as list, azet, gmail, etc.). Just a few clicks from your own domain. Domain is an important part of corporate identity on the Internet. Directly on clickeshop.com, you can easily verify domain availability and order your new domain. Standard parameters with different price have been extended with new ways to display product parameters: Image gallery and Table. Image gallery - customer selects product variant in the product detail simply by clicking directly on the image of desired product variant. It is very useful e.g. for clothing, decorative cosmetics, paints and coatings, garage door etc. Extended full text search is looking for combinations in words and helps customer to find desired product while searching not only in product names, but also in a product code and product description. The search has also been accelerated several times, and the result of the search displays to customers in milliseconds. Aafter inserting product into the shopping cart, the customer can decide whether to continue shopping or view the cart. In this way, the customer is not automatically redirected into the cart after inserting product, but can continue shopping without displaying the current content of the shopping cart. The customer remains on the page and the orientation on the page is pleasant. Delivery can be related to selected payments and in this way eliminate unwanted combinations between delivery and payments. For example prevent the customer to choose the combination of delivery (personal collection) and payment (cash on delivery). Extended login permissions to ClickEshop administrator. Possibility to add new users with different access privileges for particular modules in ClickEshop administrator (such as content management, customers, global settings, statistics).